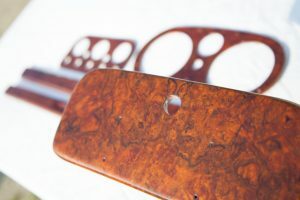 Here are answers to the most commonly asked questions about how I carry out classic car dashboard restoration projects. Please contact me if you don’t find the answer you’re looking for. Do you supply replacement dashboards? I only offer a restoration service. You supply me with the dashboard that you have, whether it is wood or metal dismantled and sent to my workshop in Normandy, France. All accessories, instruments, switches and leather etc must be removed before you send the items to me. I restore the items and return them to you via tracked parcel (or you’re welcome to collect them from my workshop) for you to remount in your classic car. Do you work on modern cars ? I only work on classic cars. As a general rule I only work on cars older than I am. That means I only work on cars made before 1970. What types of dashboard do you restore? 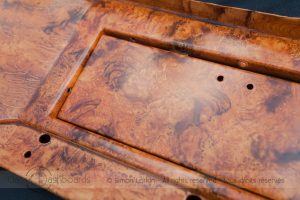 I only restore wooden dashboards and interior trim or metal dashboards and trim on which I paint by hand a burr walnut effect (or Facel Vega Effect). *Please note that I do not work on any other type such as leather, vinyl, plastic or glass. Are the dashboards restored in the car? How do we make this happen if you’re far from me and my car? Discover how I carry out dashboard restoration projects for clients around the world. Oh yes, I have clients not only in France where I’m based and the UK (well yes, I’m British) but several European countries, both private clients and garages. I also have clients on other continents, as far away as Australia! My furthest yet is 10,489 miles away! The other woodwork items seem OK. Can I just restore the dashboard? Yes, of course this is possible, however I wouldn’t recommend it if you hoping for a unified look to your woodwork. In the past I have clients ask me to do this and then they have come back to me afterwards for me restore the other items as they then don’t look as good in comparison. This then causes problems as I am trying to match colours and as those are all mixed by hand it takes more time, creates more work and therefore more cost to the client. Please let me reassure you that I am not saying this to create more work for myself, I am trying to provide the best restoration work possible so that my clients are 100% happy with the result, knowing that the dashboard and woodwork of the interior are the items that you’ll be looking at most as you enjoy your classic car in future. 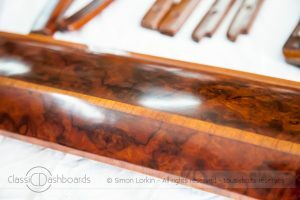 Can you guarantee to match the colour and finish if I only ask you to restore some of the items of woodwork? The only way to ensure that all your items match is to have them all restored at the same time. All colours are mixed by hand depending on the veneers and the solid wood at the time of restoration. In addition the finish (how thick or how shiny) would not be the same. My dashboard has been badly restored previously elsewhere. Can you help me? Absolutely. 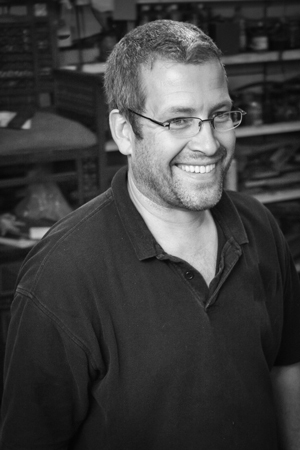 Whether your woodwork needs restoration due to the ravages of time or simply a bad restoration job (perhaps a previous owner trying to do it themselves) I can achieve your requirements. 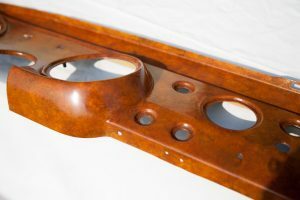 I have been restoring classic car dashboards and antique furniture for over 30 years and have been running my own business since 1991. Items come to me in all kinds of states. Some just need refinishing or some have broken pieces, missing elements or little veneer left. None of these situations is a problem, that’s what I’m here for. Is it possible for my restored dashboard to look ‘old/original’ as I don’t like the new look ‘plastic’ dashboards? Absolutely, that’s what I like doing. 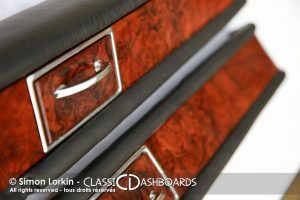 My reputation is built around providing my clients with woodwork that has been professionally restored but at the same time has kept the character of the wood and that is in-keeping with the age of the vehicle. Please contact me to discuss your requirements and I will achieve the finish you are looking for. Should I have a go at sanding off the finish before sending it to you? Please don’t try. Sadly I have a lot of experience of previous clients trying to start the project themselves but in sanding the finish the veneer is often damaged and the project has ended up more costly due to the extra work involved of re-veneering. When I remove the finish I don’t sand it off, I use products that ‘eat’ through the old finish without harming the delicate veneer. There isn’t single answer, even for two projects for the same make, model and age of car because there are so many different factors involved. What is the finish on the items at the moment? Will the veneer need replacing? Is the supporting wood in good condition or needs repair? In every case I ask my clients to send me detailed clear photos of the items to restore, in particular zooming in on the most damaged areas. These can be sent via email to simon@classicdashboards.com or by post to : Simon Lorkin, Classic Dashboards, Le Mesnage, 50410 Montbray France. Please click here to go to my prices page which explains in more detail how I price the individual dashboard restoration projects. This depends on many things; how many items there are, how much work is to be carried out on them and how much work is already in the workshop at the time. Please visit my page explaining in more detail the ‘turnaround’ to be expected for your project. Do you use the modern PU lacquer that is used in modern cars? In that case please get in touch and hopefully I can answer that for you, in person.